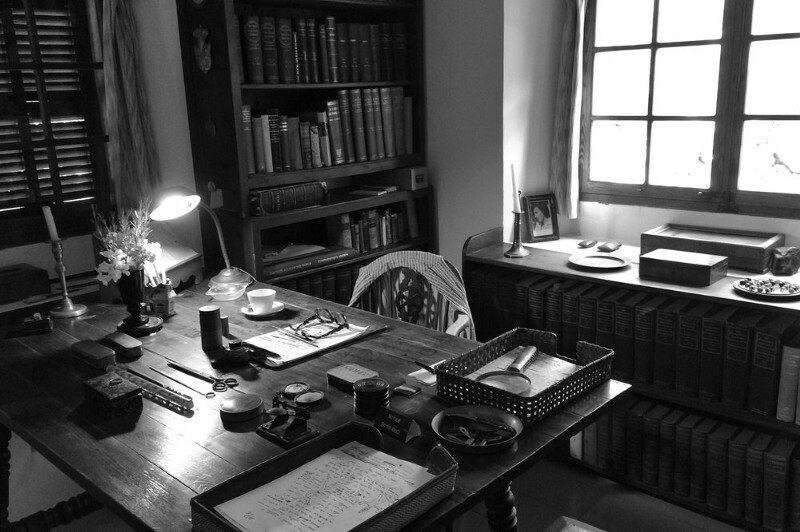 Just outside Deià, by the road to Sóller, you’ll find the house of Robert Graves, the English poet and critic. I was told a visit there would be definitely worth my time and if it was only to find out about the muses. A short ride from Deià, i found the house and the parking a bit up the road from it. Leaving the car on the parking lot, i walked back to the house and bought my ticket from an elderly British gentleman who I assume was Graves’ son. He opened the auditorium for me and started the 15-minute-video about Mr. Graves’ life. I was the only visitor at the time. After the video i left the auditorium and walked through the beautiful garden to the house, up the stairs and into the recibidor, the entrance hall. What i loved about all the rooms was the simplicity. It wasn’t packed with stuff. Some pictures on the walls, flowers on the windowsills and candlesticks on side tables. The whitewashed walls and the dark wood of the tables and beams. The fact that they had a printing press there. They actually used to publish a literary journal and letterpress books, among other things. But there were two rooms that had an atmosphere so dense that I would just want to sit there. Doing nothing. Saying nothing. Just taking it in. Looking at it like a piece of art. Those were the kitchen and Mr. Graves’ study. 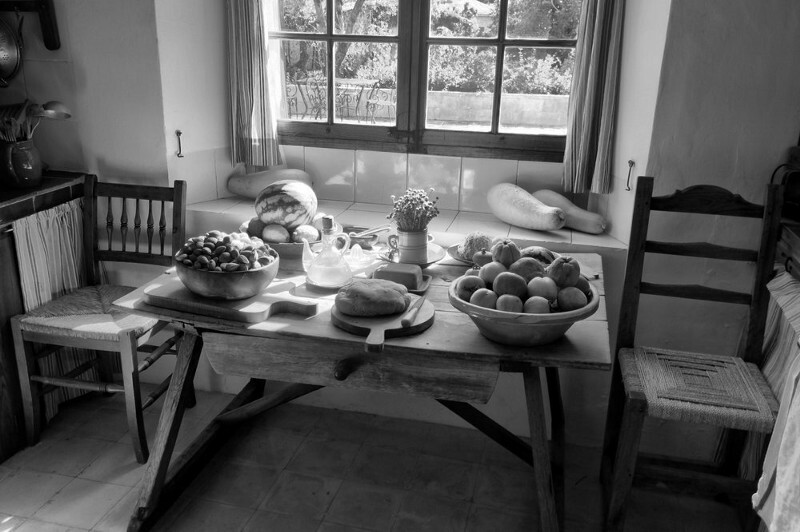 Through the kitchen window the sun shined on the still life that was set up on the table, consisting of fruit, nuts, bread and olive oil. The oil carafe was literally breaking the light like a prism adding to the mystic quality of the scene. In Mr. Graves study, his jacket was still on the chair, his glasses on the desk, next to a cup and a clipboard with sheets covered with handwritten notes and a text edited with a paintbrush. The only things running on electricity in this room were the two light bulbs and a small radio in the corner. I don’t know whether it is true, but I can’t remember hearing anything. Not even a clock ticking away. And that’s how it felt that time didn’t live there. It was not only that his things were there like he was just out to get something from the village. It was that the place was stripped down to essentials. All you need to create, which was in his case prose and poetry. I took pictures of those rooms. So I can still sit there and look at it long after I left. So I can find out what contributed to that atmosphere. So I could recreate it in a print and maybe in a place for myself that I have yet to find. Mr. Graves had come to Deia to find peace. Here he had sun, the mountains, the sea and the laid back attitude of the mallorquin people. He could walk down the path near the house to the beach — a wonderful place to sit and meditate. Later that day I was drifting in the sea on my back, looking at the clouds thinking again that I wanted a place like that. That was peaceful and timeless. That healed whatever needed to be healed. And that made it easy for the muses to visit me. Where there was nothing to scare them off. And nothing to distract me from their voices whispering in my ear: “Grow, grow …”.